Dragongate: Remembrance Day on Saltspring Island. Not a simple ceremony. 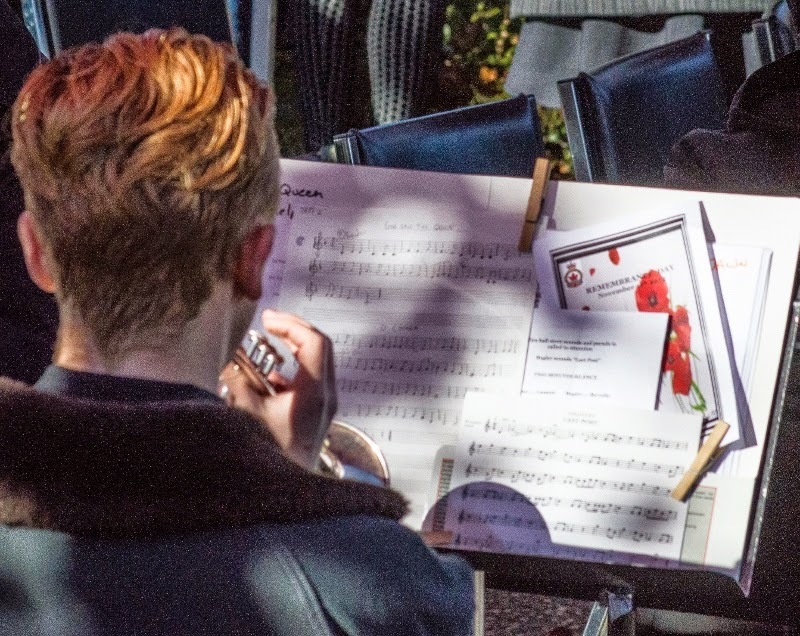 Remembrance Day on Saltspring Island. Not a simple ceremony. Last week I took our Swiss international student to experience a Remembrance Day ceremony at the cenotaph in our little island town of Ganges. I have not attended it myself for twenty years or so and with her foreign eyes beside me I experienced it from a more thoughtful perspective. A Swiss-German speaker herself and with several recent German student friends, what would she make of all this ceremony, this determined remembrance of a conflict that the 'loosing' side would just as soon forget? “Lest we forget”... “we shall remember them”... the crowds of people, the uniforms, ... marching, bagpipes, bugles and drums. The laying of wreaths... the battle of the Atlantic, Dunkirk, Juno beach in Normandy.... The service seemed to last a long time and involve every organization and business, and half the individuals on the island. How barbaric this must seem to a young Swiss woman from a country that was neutral through the European wars of the last century. And yet, she needs to experience Canadian society in this aspect too and seek to understand what exactly is being expressed on this cold morning in October. Perhaps it is not so simple after all; we remember the fallen in all the wars, we look around us at the wounded from the most recent wars as well as those of the last century, we give thanks, we perform a kind of hybrid religious and national ritual. “God is with us “we seem to say before thinking no, that was what they were saying on the other side of no-mans-land. And those ancient veterans marching past us, were there not some medals from the other side as well? We dedicate ourselves to peace here on our little western island, to working for peace within our community, supporting our local institutions and look beyond to our nation and to our world. We remember, and that remembering is within the context that some of us are at the sharp pointy end of peace keeping and peace making. We all remember the past that we may, like those islanders whose names are carved in stone before us, serve the world and struggle to make it a better place. Every year we gather to rededicate ourselves to service for the greater good. A few years ago I wrote a memoir of my early childhood in wartime Britain. Thinking about our international student and her school experience of hearing the 'war story' over and over and her German friend's distress about a history that goes back to their grandparents generation. (“ We didn't do it, and we love our country”. ), I realize how focused on the 'war' I and my generation are. Born into it, ( during an air-raid) expecting nuclear annihilation in my adult years, aware of the wars and dislocations that have come since, mine must seem a 'warrior' mentality. I have seen a longer time span and have a more nuanced view of humanity than my student from Europe. Thinking good thoughts is not enough, but thinking bad thoughts isn't either. We need to understand. Here are my remaining fragments of the story of the Yanks (USAAF ( 457Bomber Group ) in Connington, our little village during the war, and it was not clear cut then either. I remember seeing a flag over a hedge; an American flag, I am told. My Father walks around our house during air raids on the look out for incendiary devices. Our 300 year old home has a thatched roof that would go up like a bomb. The family shelters under the big oak table. A crashed German plane in a nearby field is pillaged by a stream of airmen seeking souvenirs. It later explodes from a delayed action bomb. Mom is always cooking meals for the Yanks using food “provided” from the base stores. Presumably we got a share in return. Tight rationing for British families. Dad is very interested in hearing stories of the latest mission. Wounded in WWI, he is out of this one but has his village Home Guard unit. Brother John listens in. The first Americans we meet are the engineers who built the airstrip. “What are those medal ribbons for?” Dad asks an old railroad engineer, recently arrived. “Well this is my WWI, this is from my state, this from my railroad union, this for enlisting...” Not wrong, just different from the British system. We need to adjust to American ways too, but really they are mostly so nice that is not so difficult. And yet our village feels as occupied as many a village on the other side of the channel. My dad has spent years of his youth in Canada and the US, only returning for WWI. He feels an empathy for these boys so far from home. They return our welcome many times over. My parents stand outside in the night and watch the city of Coventry burn from a massive and deliberately scorched-earth air raid. When later, Germany feels the bite of devastating Allied raids there is little sympathy here. They started it but we will finish it. Hard words, strong emotions. My brothers watch the con-trails in the sky as fighters and bombers grapple far overhead. They race around acting out these battles. My brother Paul is still to this day called 'Hawker' ( Hurricane). They build an 'ack-ack gun' in the orchard out of old pipe, overlooking the runway. The village bobby comes to put a stop to their pretending when the returning aircraft come under 'fire' . The poor guys with jangled nerves did not appreciate even this bit of fun at the end of yet another daylight mission. A time when the sky is filled with aircraft: Dakotas full of parachutists and gliders packed with soldiers under tow, all headed for Normandy and the beginning of the liberation of Europe. Those big B 17 four-engined aircraft would no longer roar past our house and stagger into the air with a heavy load of bombs or limp home again full of holes. Half of those young men who had swept into our family’s life would be home again. But those that survived the war would remember us all their lives as we would equally honour and remember them. It is interesting to think about those on the receiving end of all the bombs carried by those B 17s. I met a German man while we were sailing the Pacific who had been a teenager in the Hitler Youth and had hauled the injured from collapsed buildings. Perhaps he was on the receiving end of those same bombs loaded on aircraft just down the road from our home and dropped by those nice young men we knew as friends. Such is war. He said to me,” You know Bill, we could have won the war.” and I replied, diplomatically I hope, 'Yes, but wasn’t it just as well you didn’t? Even allowing for the bias of history written by the victors, and allowing also that not every SS Officer ( his father) was a monster, surely we can agree that a world ruled by the leadership of the Nazi party would have been worse than the Roman Empire ever was?” He had no good answer to that.